After performing my evening exercise at the park on Friday around 5:45pm, along with my daughter Dila and my sons Ahmad and Khadim, I rode home on my motorcycle. After I parked the motorcycle and greeted my wife, we sat down for a few minutes while waiting for Maghrib Adhan. My two-year-old son, Khadim, went to his mother asking for food. My other children sat with me. Not long after that, Wahyu (a local Ahmadi) came to join us in Maghrib Salat. Suddenly my house began to tremor fiercely. Quickly, I ran into the entrance door, screaming, “Run! Get outside! It’s an earthquake!” I grabbed both my daughters’ hands. Both of them stood near me. My third child, Ahmad, tried hard to run outside. We were crashing at all sides, to the left and to the right, because of the strong shocks. All buildings were moving in all directions. The mosque rumbled. Water from the pool began pouring in all directions. We were disorientated and fell to the ground losing all energy and strength. Meanwhile, my wife and the youngest child tried hard to fight the shaking so that they could get outside the house. They banged the wall and crashed to the floor repeatedly. The youngest child kept falling out of his mother’s clasp. Wahyu quickly ran from the mosque towards me and sat under a dangerous power pole. The pole shook violently above our heads. By now, I really wanted to help my wife and my young children who sat helplessly at the entrance door trying to get out from the building. But I couldn’t do anything as I was losing my balance. Fortunately, Wahyu quickly stood up and ran towards my youngest child. My wife’s nose was bleeding as she had tried so hard to save herself. When the earthquake stopped, I screamed calling “Daeng”, a nickname of Mahdi Haris Sahib who resided at the old missionary house. He is an elderly person. I was worried that something might have happened to him. As I remembered him, I cried whilst reciting a prayer for him. I was afraid something bad had happened to him. For a long while, I did not hear any response. I kept calling out his name. Finally, he answered by banging the door and screaming. As he came out, he had a smile on his face. I was still afraid in case a tsunami was coming. Not long after that, the kitchen building of the masjid complex collapsed. A 2.4-metre bookshelf collapsed inside the house. There was heavy damage to the mosque floor, with water everywhere. I instructed Wahyu to take one of the motorcycles and take my wife and two children. I found my keys on the floor under the chair. I quickly saved my wallet and cell phone also. My wife, now already seated on the motorcycle, shouted to me to take the homeopathy box. My home was already drowned with water and everything was scattered. Due to the panic, my children were crying. I tried to calm them down. I ran back inside my home and quickly grabbed the homeopathy kit. Thereafter, with my two daughters, Ami and Dila, I took the motorcycle. I also told Daeng to save himself as I could now see water coming from all directions. Both our motorcycles now set off in an attempt to save ourselves. I tried to find directions to Sidera Sigibiromaru (an inland area) looking for a shortcut by entering an alley. But the alley was blocked by my collapsed house. So I decided to go back to the big road and drive in the opposite direction. The road condition was terrible. The earthquake had literally split the road in half. As I rode, I saw many people running with their bodies drenched in water and covered in mud and soil. Children were crying and panicking. I felt panicked, but I managed to get a grip on myself. As I continued to try and calm myself, I prayed so that I could figure out a means for our safety. I continued to ride my motorcycle in the middle of screaming and frantic people. Meanwhile, it began to get dark. I continued to whisper to my children to keep praying. Then Wahyu shouted that there was a shortcut using a bridge. Although it seemed like a good idea, I thought to myself that it was impossible the bridge still existed. At the Biromaru intersection, I should have gone straight, but due to the heavy traffic, I could not wait patiently. The asphalt on the road had twisted and formed bumps and fragments that made it difficult to drive on. In front of me I noticed a path that I could go through. 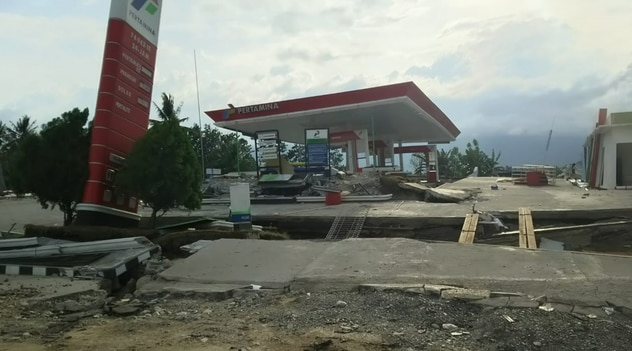 Immediately, I called Wahyu and shouted to avoid the bridge and to take the street through the river’s mouth that had not been properly built yet. Here, Wahyu went ahead of me. As we rode on the rocky road, it gradually became difficult for me to ride the motorbike as the cracks in the road were filled with water and it became difficult for the motorbike to pass. Several times, we got stuck in those cracks. As I struggled to get out of one of the cracks, survivors crowded on the street. I instructed my two daughters to walk forward as far as they could until they reached a better road accessible for motorcycle, while I attempted to carry the motorcycle along the street. At this point, I could no longer see Wahyu. After walking continuously for some time, that destroyed path thankfully ended and we found a more smooth road towards Sidera Sigibiromaru, a nearby village. Although I only had on a shirt and shorts, I did not forget Salat. With my two daughters, we performed Salat while sitting on the motorcycle in the middle of the road. Immediately, I began looking for Wahyu along the way who was with my wife and other two children. I searched for them hoping that they were already in the place we decided to meet. In the middle of the road, there were lots of afflicted people stuck in the same place. The condition here was far worse than other roads I had crossed. I began to think that Wahyu had taken a wrong turn. I left my daughter with a survivor, Kuat Sahib. Meanwhile, my other daughter did not want to be separated from me as she was really scared. Along with my other daughter who was with Kuat Sahib, I took her to the mission house complex to Nanang Sahib’s family, who was a survivor and where she was willing to stay with. Kuat Sahib, my children and I were served instant noodles, courtesy of Nanang Sahib’s family. I forced myself to eat as I knew my family had still not been found and I must look for them. That night was spent looking for Wahyu along with whom were my children and wife. I looked for them at a road that they may possibly have passed. 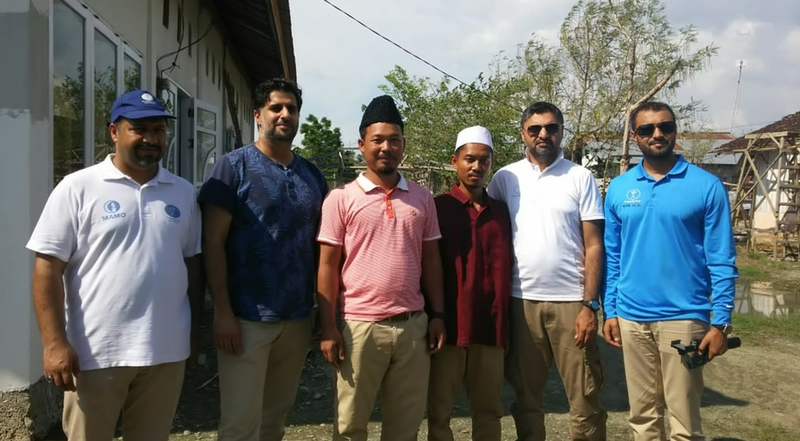 In fact, I even looked for them at the mosque in Palu, but I could not find them. 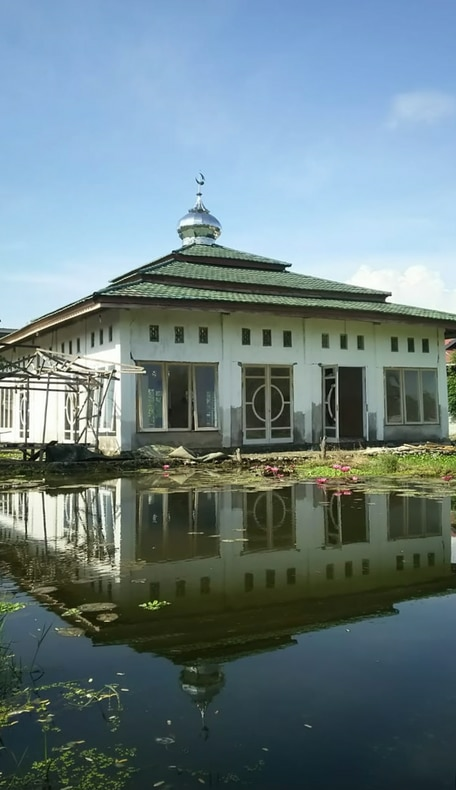 By the grace of Allah, all Ahmadi homes in Sigibiromaru stand because most of them were constructed from wood. The mission house also did not collapse although I thought it might have. In the middle of the third night, I gave up searching for my wife and the other children. I ensured myself that Wahyu would keep them safe even though I was unsure where they were. During the night, although I was on a warm mattress covered with a blanket, I could not sleep as I felt anxious and worried about my wife and the other two children. I imagined them in the bitter cold and struggling because of the cold weather. I imagined them resting in a place drowned by mud and water and without any mattress. I imagined them surrounded by mosquitoes and without anything to eat or drink. All negative thoughts crossed my mind. All I could do was pray for them as I kept trying to look for phone signal that was lost since the earthquake. Thankfully, the first text message was sent. It was sent to Amir of Indonesia, Abdul Basit Shahid Sahib who I informed that myself and two of my children were saved to which I received his reply with prayers. Unfortunately, I could send no further text message as I lost signal again. At midnight, I saw one Ahmadi calling someone using WhatsApp. Hurriedly, I borrowed his phone and entered all random contacts on my phone. Then I called my brother in Semarang informing him that I was safe but separated from my wife and two children. I also called another friend who I knew always slept late and would answer my call. I closed my eyes and saw Wahyu’s faces, my son in front of him and my wife with a swollen face who held onto my youngest son. All of their faces looked calm. I felt gratefulness. I believed that Allah would save us with His best plans. By the grace of Allah, I arrived home on time from that evening exercise. If I had returned any later, the earthquake would surely have hit us at Potobo. At the time of the earthquake, the soil literally split into two parts. The ground rose up and suddenly dropped. Mud came out from the ground swallowing the houses and burying them in its depth. Wahyu also came to the mosque in perfect timing. Had he not, he would probably be buried alive inside his apartment that had collapsed and was buried under the mud. At 5:30 the following morning, I asked Nanang Sahib to look for my family again, after previously discussing to which directions should we go. We decided to enter the most damaged area at the bridge – the epicentre. We heard lots of people went there for shelter and were stuck over there. Only one or two kilometres into our journey, I could see a man ride with a woman in a hijab. I abruptly shouted, “Allahu Akbar!” I knew they were my wife, Wahyu and my two other children. Alhamdolillah, all Ahmadis were saved and we all experienced the height of gratefulness.